You would think that Mr. CiclaValley would turn his nose at other CicLAvias now that the valley got its first taste. No. On the contrary. It was such a great experience that I’m excited to see it shared with other parts of Los Angeles. Or Pasadena. We’re all in the same gang. Another reason I’m so behind this incarnation because there’s no way I could put together another set of valley-level CicLAvia previews like I did a couple of months ago. I’d be collecting weird jars like Howard Hughes if I went back to that. The news is I am going. No pressure, no timeframes. There’s no place I have to be. I won’t even be selling CiclaValley t-shirts(although the one I’ll be wearing is available for a discount). But since I am going, I can’t just show up. Mrs. CiclaValley and CV Junior will be coming along for the ride, so I better come up with a game plan or else this shortest CicLAvia might become my longest day. The good news is that I’m not walking into this blind. I’ve spent my share of time along Colorado Blvd., despite the fact that I’ve never gotten to see my alma mater march in the Rose Parade. Mrs. CiclaValley is also from Alhambra, so we still cut loose in the Crown City on the way to family trips. So Ya. I gots knowledge. As I already mentioned, the Pasadena route is distance challenged, covering 3.5 miles making the valley event over 50% longer. Combined with the high attendance, multiple car crossings and the protruding spurs, expect the streets to be a bit more crowded than other events. Mr. CiclaValley prefers to walk this one. Mrs. wants to bike. CVJ now climbs into the trailer and buckles herself in. I’m guessing she’s the tie vote. The route should take you about a half hour to cover every square inch, so instead of getting repetitive stress disorder, plan to spend a lot of time wandering around by foot. This isn’t Pasadena’s first parade, so they’re used to this amount of street traffic. Plan to eat, shop and play around. 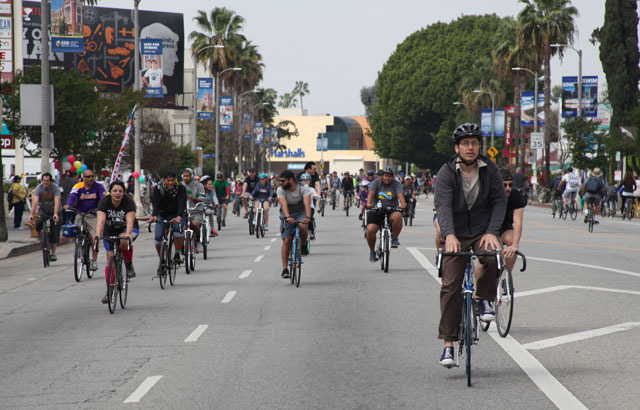 CicLAvia’s aren’t just about the cycling, but interacting with the communities they take place in. If you chose to go by the Metro Gold Line, remember they have smaller cars than the Red Line, so expect tighter quarters. 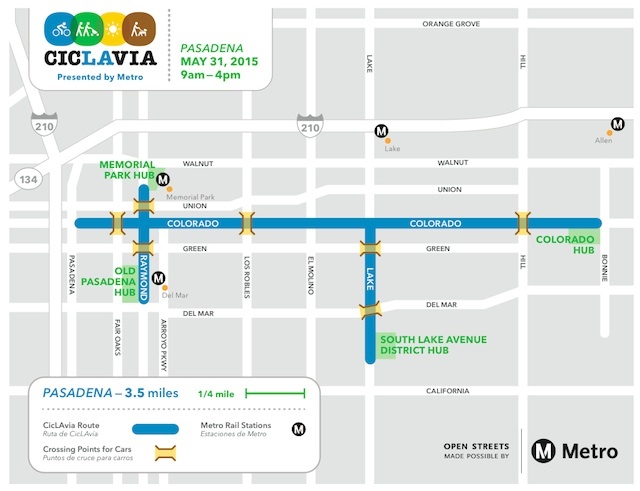 Parking near Colorado is normally problematic, so CicLAvia will have an exponential effect. Don’t give up hope though. You’ll have bikes after all. Arroyo Blvd. is a quaint stroll that’ll take you to the western edge of CicLAvia and you can include the Arroyo Seco Bike Path if you want to start back further. Even biking from Union Station is about a ten mile ride that’ll surprise you with it’s beauty and ease. Of course, there are a number of feeder rides, including Burbank, Glendale and Mt. Washington area. 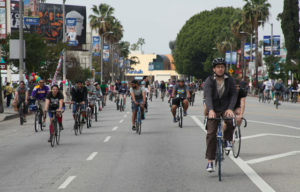 To find more, check out the CicLAvia page. I always encourage people to wander off course because it’s fun to discover. 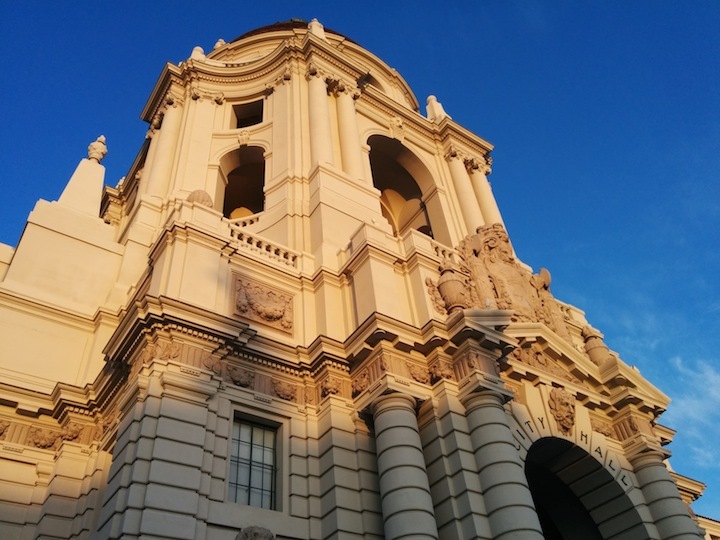 Consider visiting the Gamble House, Cal Tech and the Pasadena City Hall. The route also has four hubs, with a number of activities going on at each. I’m looking forward to the Cirque du Soleil’s Kurious Zone at the Colorado Hub and the Art Center showcases at the Old Pasadena Hub. When I travel to Pasadena, sometimes it involves extracurriculars. Lucky Baldwin’s is one of LA’s best beer bars and Congregation Ale House belongs high in the upper tier. If you’ve never visited the Stone Brewing store before, you’ll wish there was one in your neighborhood. Remember that this Sunday promises to be a bit hot, so bring water along. And a cooler. And beats. Be ready to have fun.